In the late 1870's, some residents of Columbus formed a "library association" to establish a lending library like those in the other towns springing up across the nation. Anyone could become a member by contributing a few books to the collection and by paying the fee of $1 per year to purchase new materials for the collection. In just a few years, however, this grand experiment failed and the library was forced to close its doors. Sometime in the late 1880's, the Young Men's Christian Association, which maintained rooms over Mrs. LaBock's Apparel Shop, decided to sponsor a library. The Lamb and Stires Book Store, recently closed, had offered its remaining books and Bibles to the YMCA without charge. Other books were solicited from the local residents and a new public library was opened. For a time it was well received, but when the YMCA closed, the library was disbanded. In the late 1890's, the recently formed Columbus Woman's Club took up the library challenge. The club secured pledges of support and donations of books from members and other concerned townspeople. Realizing that a library needed tax support to provide the materials and the services required, the club petitioned the City Council to form a public library. On a cold and rainy night, all the members of the Woman's Club sloshed through the muddy streets and over the slippery wooden sidewalks to attend the City Council meeting. Rather than establish the library as a funded department of city government, the City Council agreed to allow the Woman's Club to install a few bookcases in the City Council chambers and use that room as a public library. 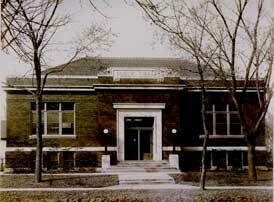 In 1900, the Library had proved itself and became a regular city department. By ordinance the City Council established a Public Library and created a board of nine members to oversee it. The library continued to be housed in the City Council chambers which, at that time, was on the second floor of the Gray Building at the southwest corner of 13th Street and 25th Avenue. Around 1912, a room above the newly constructed Columbus Candy Kitchen building on the northeast corner of 13th Street and 26th Avenue was rented and Miss Fanny Geer was hired as the librarian. The rent for the room and the salary of Miss Geer were each $12 per month. Total expenses for the year were $300. As the Library grew more popular, the collection expanded into other rooms on the second floor of this same building. The early years of this fledging library were not easy for Miss Geer and her collection of books. At times the City Council showed it little sympathy. When bills for new books were presented to the Council, certain members would try to disallow them. For 11 years, Miss Geer served as librarian. Due largely to her untiring efforts and those of the Library Board, the library prospered. Including the time it has been located in the City Council chambers, the Library had always been on the second floor of a downtown store. In 1914, Mrs. Betty Gerrard offered to donate suitable land to the city to build a library. The site, at the southwest corner of 15th Street and 25th Avenue, was chosen. The Carnegie Library Foundation presented $13,000 to the city for the construction of a library building. In 1961, the Carnegie building was renovated and an addition was added on the south, which nearly doubled its floor space. The late sixties and early seventies were very demanding years for the library. The city was expanding, the schools were consolidating and enrollment was growing. The "information age" was dawning. The Library Board began to seek an alternative to the small Carnegie building. A Library Foundation was formed and an effort was made to raise funds to purchase a new site on which to build. In 1976, the city purchased the two NPPD buildings on the north corners of 25th Avenue and 14th Street. The city offered the building on the northwest corner to the Library Board provided it could raise the funds necessary to remodel it. The Library Board turned to the Library Foundation for help. The members of both the Foundation and the Board solicited funds from the public to pay for the remodeling costs. 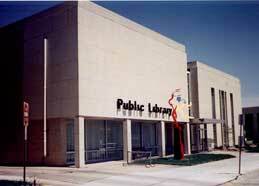 On April 22, 1977, the remodeled 33,000 square foot library building opened. It provides a great deal of reading room and study space, as well as an auditorium, four meeting rooms and space for two art galleries. The response to the new library in 1977 was tremendous. Prior to the opening of the new building, total check out of materials had averaged 70,000 items per year. During the first year in the new building, total check out jumped to 100,000 items and in subsequent years, the number of items checked out increased to over 180,000 per year. The Columbus Public Library continues in the spirit of its founders as it combines the continuity of tax-based funding with the generosity of public-spirited philanthropy.